Wedgwood - Etruria today. Barlaston tomorrow. 23 Josiah Wedgwood & Sons, Ltd. (Head Office at Barlaston). "If the company was to compete successfully in international markets, ways had to be found of increasing not only the quality of design, but the volume and standards of manufacture. Under any circumstances this meant a major re-building programme, and the prospect of undertaking it on the original site was becoming increasingly remote. Ten years later he constructed a model factory. Here his products could be manufactured on a 380 acre estate in clean air, at a safe distance from the growing towns of Hanley and Newcastle-under-Lyme. 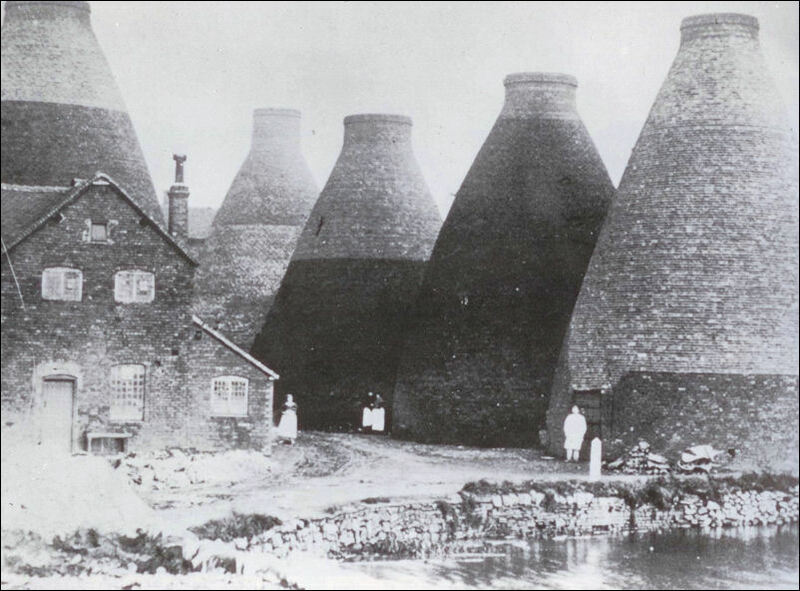 Factory operatives were afforded the opportunity of living in a healthy environment, in houses specially built to standards surpassing those generally found in the Potteries at the time. But inevitably, the conditions which attracted Josiah in the first place —ease of access to the Trent and Mersey Canal, which later would be joined by the London to Manchester railway line, proximity to good mineral reserves, and the availability of plenty of skilled labour in the surrounding Six Towns, proved equally attractive to other processes in the industrialisation of the region. Mines were sunk to extract the coal which ran under the estate, and, of equal importance, an extremely successful steel mill was founded immediately next door to the factory. 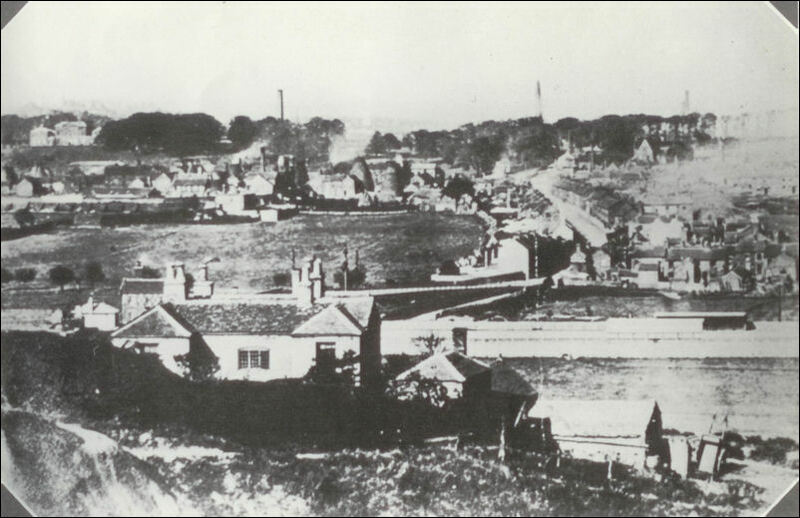 Nearby there were also a large gas works and long-established bone and flint mills. A spectator looking over the valley from Hanley or Basford would now see nothing but factories and pit heads, with occasional patches of waste ground and clusters of houses. There was no longer any possibility of pushing back the walls of the Etruria premises, and, as a survey carried out by Tom Wedgwood in 1935 confirmed, there were two overriding obstacles to any attempt to clear the site and build a compact new factory. The notional spectator would in fact have been very lucky if he had been able to see right across the valley at all. Smoke was an old problem, to which the factory's bottle ovens made their own contribution. The Wedgwood family itself had abandoned Etruria Hall, which overlooked the works, back in the 1840s because of the increasingly dirty atmosphere. Most of the processes in the valley were coal-fired, with little effective control over emissions from the boiler chimneys. The railway engines working up Etruria bank alongside the factory wall added to the smoke blowing over the works when the wind was in the wrong direction. To an extent, managers and workers were inured to such conditions. Everyone expected for instance, that if it snowed, the white would have turned black by the following morning. Such was nature's way. Much more serious was the increasing loss of production due to brown specking on the glaze. Claude Walker was deputised to place grease-covered zinc plates in strategic places on the factory roofs, and subsequent analysis confirmed suspicions that the culprit was the adjacent Shelton Bar steel works. The investigation revealed that, 'between seven and fifteen cwts. 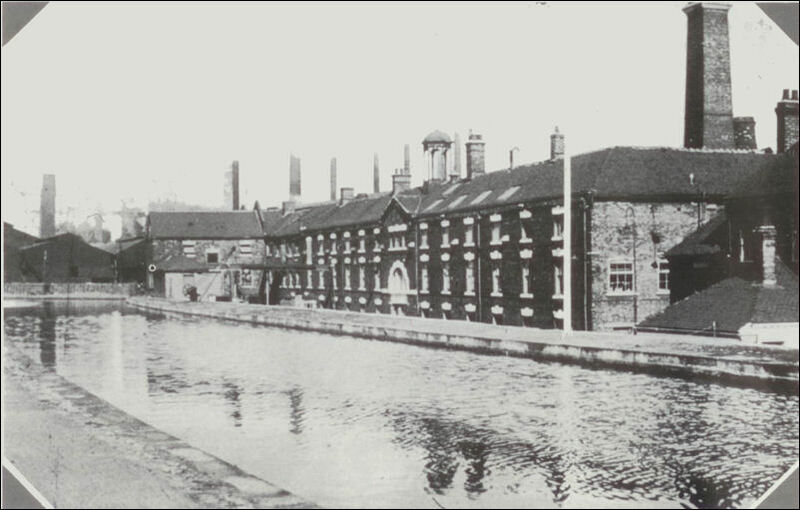 of dirt was deposited monthly on the Etruria works, and that between 25 and 45% of this was either iron or iron oxide. It has been estimated that the amount of loss due to iron specking amounted to £2,000 per annum.' This was about a sixth of total profits for that year. Iron filings were raining down in such quantities as to overwhelm any attempts to protect the ware at the most sensitive points in its manufacture. In desperation, magnets were set up over the dipping process in the hope of catching the filings before they contaminated the glaze, but it was no sort of solution. The steel works and the pottery factory could not remain neighbours. With the old fashioned drains, dating back to Josiah's times, there was no actual plans of the drainage system. They were haywire, through building different portions of the factory at different times, and the main drain that used to run off the front of the works down to Fowlea Brook was arched brickwork dating back to Josiah's time, and that had subsided with the front of the works, approximately about eight feet, and henceforth the back of the drain was broken so whenever there came any heavy rains or storms, the front of the works was flooded, it was all coming back again, so that again was another reason for moving. 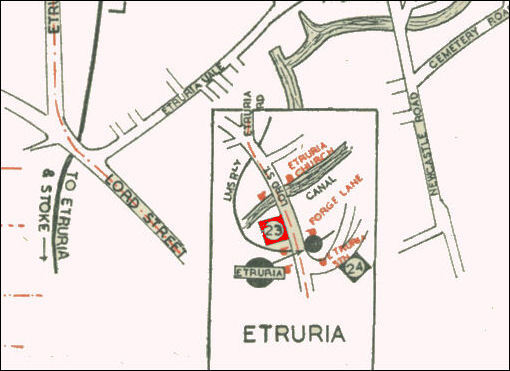 Once the survey had confirmed what was apparent to everyone working at Etruria, the Board began to move towards a decision. At at meeting of the directors held on November 26,1935, the matter of subsidence was given serious consideration. Josiah reported that Shelton Iron and Steel Company had decided to undertake, in the near future, mining operations at the deep levels adjoining and underneath the works. The precaution taken in the nineteenth century of purchasing coal seams immediately beneath the factory to a depth of 650 yards would be rendered ineffectual. In the event of mining operations below or adjacent to the purchased seams, there was considerable danger that the core of coal below the factory would crack, worsening the problems of subsidence still further. The directors considered the matter a serious one and agreed that the question of a new plant and a new site might have to be considered as a practical possibility in the relatively near future. In these circumstances, it was decided that any extensions to buildings and plant which were not absolutely necessary nor likely to pay for themselves in two years should not be undertaken. The next step to be taken was the selection of the position of the new factory. Given the patchwork development of the Potteries conurbation, there were a variety of possible locations between or adjacent to the townships. Serious consideration was given to sites at Knutton and Meir, but these were rejected on the grounds that there would remain problems of pollution, and that there would be insufficient space for the kind of factory community which was being contemplated. The Keele Hall Estate, now the home of Keele University, and Park Hall Estate, Longton were also investigated, before the choice eventually fell on a 381 acre site, four and a half miles south of Etruria, but still situated on the banks of the Trent and Mersey Canal, and with good access to the London to Manchester railway line. Here it was unlikely that any other industry would again encroach on the factory and the model village. The quality of the factory's output and the health of its employees would be secured by the unspoilt rural surroundings. It was a leap into the future which would retain links with the past. Barlaston had been associated with the Wedgwood family since the early nineteenth century when Josiah I's widow Sarah had made her home there. In the 1840s Francis Wedgwood reluctantly abandoned Etruria Hall to become an early commuter, writing to his son: 'I never look at it without regret at leaving it and yet when the east wind blows it is overwhelmed with smoke and when the south wind blows we have the smell of the boneyard — we shall not have such a good house nor such nice trees at Barlaston, but at least we shall be regularly in the country.' Since then, a number of the Wedgwood family had made their home there. The directors would free themselves once and for all from the restraints of Etruria, but at the same time could claim they were recreating Josiah I's original vision of a model factory and village set in sylvan surroundings. The project would enhance Wedgwood's claim to be distinct from and superior to its rivals in the Potteries, and once more make its works and surrounding housing a place of pilgrimage for all those with an interest in what the future could and should look like. The local press responded enthusiastically to the announcement: '...the most original and courageous adventure which has been witnessed in our time' proclaimed the Evening Sentinel. 'If old Josiah had not hitched his wagon to a star, he would not have attained a reputation that is still at the peak of industrialism wedded to scientific artistry. History may well be repeated.' 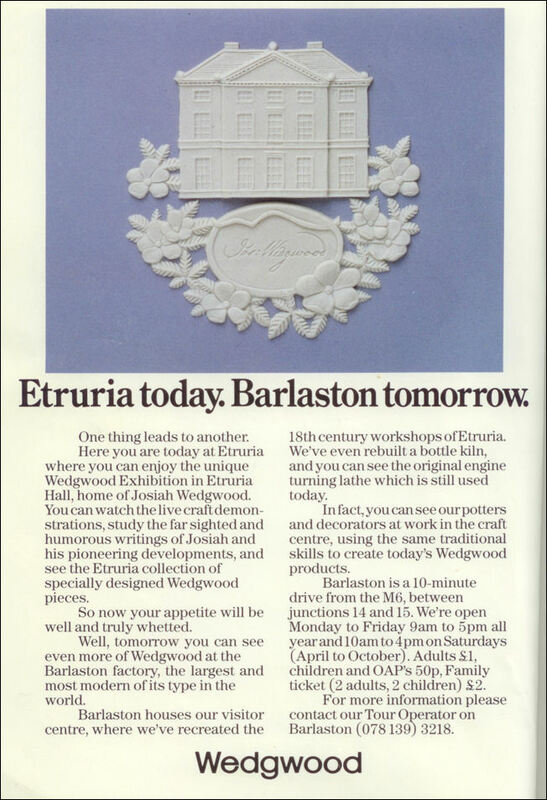 "
"Wedgwood Barlaston 1938 to 1988"